(Lowell, MA) Finally, a political play that is as absurd and as over-the-top as the 2016 presidential election! Um, I’m not sure that’s a good thing. 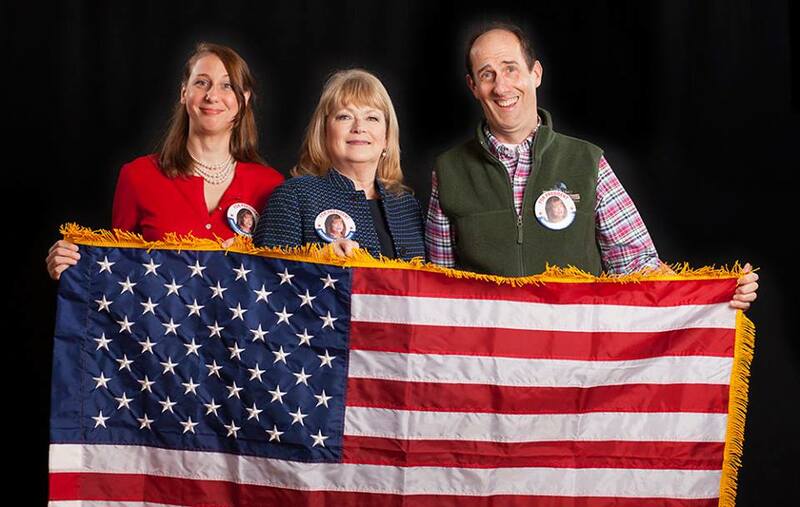 Actually, it’s not half-bad, because Home of the Brave at the Merrimack Repertory Theatre is much, much more entertaining and much, much less gut-churning than the 2016 race. It may be a half-baked political comedy, but it is a really fun half-baked political comedy. This new play opens on Christmas eve, perhaps to time it well with the Iowa caucuses in four years or perhaps to position it well for theaters desperate for secular Christmas stage fare (Christmas is not a major plot point, but what the hell, right?). Senator Bernadette Spence (Karen MacDonald) is bemoaning the defeat of a major bill when a dashing British stranger, Adrian (John Gregario) shows up unannounced at her office. Within a few minutes, he’s convinced her to run for president, and now she has to convince her family it’s the right thing to do. Bernadette has her work cut out for her, as her daughter, Marianne (Veronika Duerr) has brought home a pretentious “friend” from college, Val (Jordan Brodess), and is disdainful of worldly pursuits. Meanwhile, the senator’s long-neglected husband, Owen (Joel Van Liew), wants the green light to take a new job as head of surgery. Will Bernadette get her family on board? What is Adrian up to, for reals? Who announces their presidency on Christmas? Really, this script still needs some work, as there are many loose threads. The one that bothers me the most is a constitutional question that I could discuss, but then I would be guilty of sharing a spoiler. But it’s on the right track, and director Sean Daniels wrings a lot of enjoyment out of this script by allowing his cast to joyfully vamp up the characters to 11. It also helps that Daniels allows himself to employ an ample amount of sleight-of-hand blocking for the play, which both keeps the audience’s attention and lets us know that they know this play is silly, too. If only we could laugh so heartily about this election cycle. This entry was posted in Comedy and tagged 2016, 2016 presidential election, April, Craig Idlebrook, HOME OF THE BRAVE, Joel Van Liew, John Gregario, Jordan Brodess, Karen MacDonald, Lila Rose Kaplan, Lowell, MA, May, Meghan Moore, Merrimack Repertory Theatre, Sean Daniels, Veronika Duerr by craigidlebrook. Bookmark the permalink.